Unit #7 is located on the lower level and has a garden view. 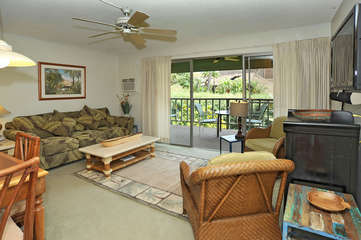 It is close to the pool and only a few extra steps to the beach. With a California king size bed and AC in the bedroom and a new sleeper sofa in the living room, this unit comfortably accommodates up to 4 guests. This condo has a flat screen TV in living room with DVD.